oil | eat. drink. cook. travel. We left bright and early the next morning, with our driver pushing as fast as he could in our little pop-top van so that we could get some sightseeing in on the first afternoon in the Masai Mara Reserve. But first we had to pass by the Great African Rift Valley. 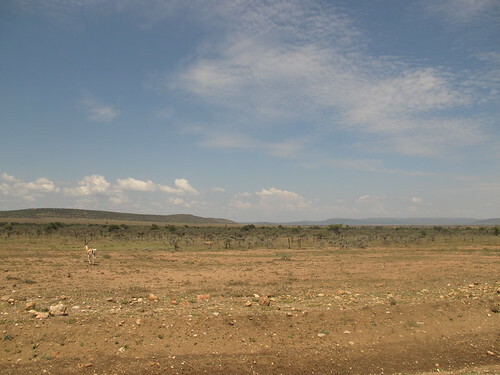 Its wide expanse soon disappeared into the plains leading to the Masai Mara, a testament to the vastness of the land we were passing through. 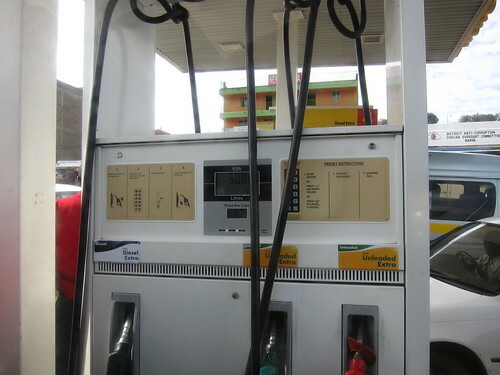 We stopped several times for petrol and were deeply dismayed to find that we had inadvertently supported Gaddafi’s dictatorship (this was while he was still in power) at the local OiLibya station. 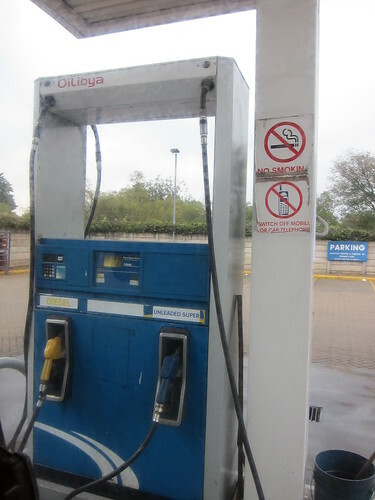 At another petrol stop, we were glad to note that our driver wasn’t the brand loyal type and marvelled at how cheap petrol is in Kenya (116 Ksh is about S$1.70 per litre). 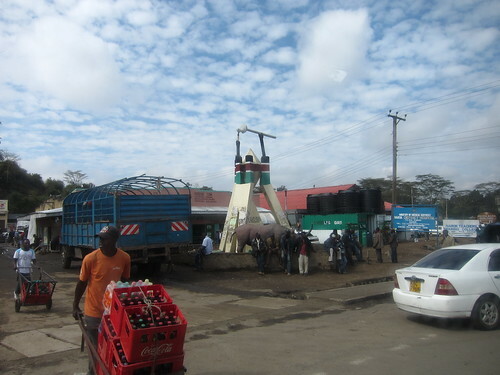 To get to our prize, we passed through many small towns, largely made up of shacks lining each side of the road. 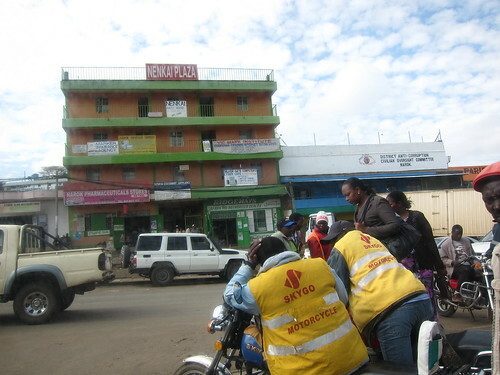 In the main towns, the shacks gave way to actual concrete buildings, still looking rather ramshackle. It was a wonder to me that a wee building like this could be called a plaza! There were odd little monuments in some of the towns, like this one of some kind of oil-extracting structure with a rhino statue in front. Still, it was a nice place for the neighbourhood boys to hang out. 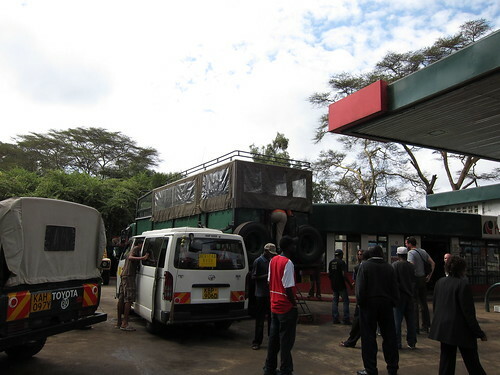 And there were yet more petrol stations, here complete with a safari truck that dwarfed the rest of the not-small offroaders. Check out the large specimem of behind clambering in. No wonder the locals were staring. After a good seven hours on the road, we finally saw scrubland, and with it our first sighting of gazelles. To be specific, Grant’s gazelles. First up, this is one of those recipes that didn’t do too well. I was intrigued by Nigella’s recipe of a cake that used olive oil and I thought it’d be a healthy alternative to a butter cake. Plus, with apple and cherries (I substituted those for the original raisins), what could go wrong? Nobody except me seemed to like it. DC said the olive oil smell made him think of chicken rice. Don’t ask me how that man thinks, but in my world, chicken rice isn’t made with olive oil. My mum asked whether it was supposed to be bread or cake. I guess they thought it a tad dry. I wonder what’s wrong with my taste buds because I found it moist enough, and not too horribly sweet. 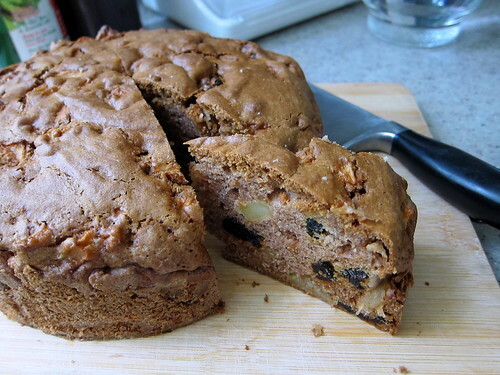 I liked how the apple and cherry brought in bits of texture and flavour to the cake and thought it was a nice homespun type of thing to eat for breakfast. All the same, if you’re game for something controversial, or have run out of butter and there’s nothing except olive oil and apples in the kitchen, then please try this recipe and let me know if you got any better reviews! Butter and flour a 20 cm springform cake tin. Heat cherries with rum in a saucepan, bring a boil and then take off the heat, allowing the rum to soak into the cherries. Alternatively, soak the cherries in rum the night before. Using the whisk attachment of a cake mixer, beat the oil and sugar together briefly, then add in the eggs one by one. Beat for a few minutes till well incorporated. While the mixture is beating, measure out the dry ingredients and sift them together. Fold into the egg mixture. The batter will end up quite stiff. Then drain the cherries and mix with apples (this is to make sure that the apples and cherries are well dispersed in the batter), then stir it into the cake batter. Give it a few good stirs to spread out the fruit evenly, then dollop the batter into the springform tin. Bake till a cake tester comes out fairly clean, i.e. no wet batter and only bits of crumb, about 1 hour. Let the cake stand in the tin for about 10 minutes, then turn out and leave to cool. Slice and let plenty of people try, I’d like some comments please! It’s official. Nantsuttei is now top of my list of best ramen in Singapore. 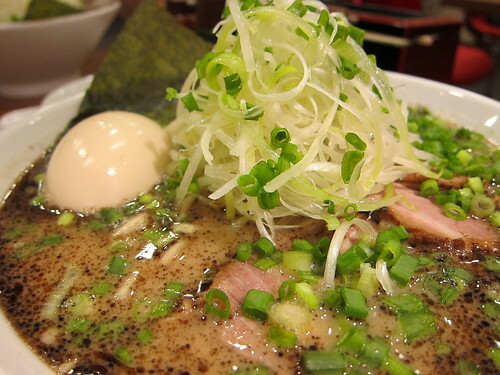 It’s also pretty reasonably priced as far as ramen in Singapore goes. The queue here isn’t as feral as the one at Ippudo. For lunch, as long as you avoid 12.30 to 1.30 you’re all good, and for weekday dinners after 8pm is normally OK too. I first tried the comes-with-everything noodles plus an egg. It came with a huge sprinkling of spring onions that seemed to occlude the rest of the toppings of chashu, beansprouts and special garlic oil. The first thing I bit into was the egg and it was eggy goodness all the way as the white was lightly salty from the braising and the yolk just set so the very inside was still slightly runny. So far it’s the best egg of the major ramen shops. As far as the chashu was concerned, it was rather run of the mill. Nothing much to write home about on the taste and tenderness. Next was the noodle. It was just the right firmness for me, with enough bite for interest and not so hard that I felt that it was undercooked. The wonderful thing about the doneness of the noodles was that the noodles still tasted good when I got to the bottom of the bowl. Then the soup. I wasn’t sure about this because it was quite salty and not particularly rich as ramen broths go. It was pretty acceptable though. I also wasn’t too keen on the slightly burnt and carcinogenic taste of the black garlic oil that makes the place famous. On another visit, I tried the dragon ramen. It’s basically the same ramen minus the OTT spring onion topping and with spicy bean and minced meat paste. Now this may not be particularly traditional, but it made all the difference to the soup, making it my all-time favourite. I liked the flavour of the spicy paste because the taste of the fermented bean really came through. It also muted the burnt garlic taste, making it Very Yummy. Nantsuttei doesn’t have a great deal to offer in terms of sides, only chopped chashu rice and gyoza. 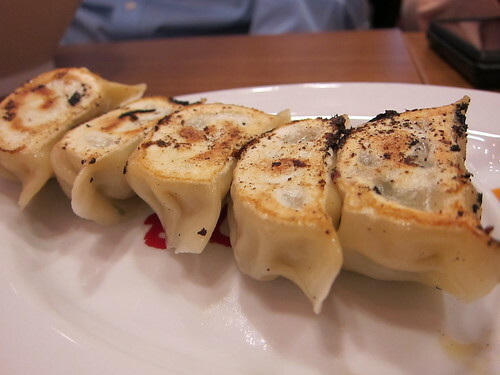 The gyoza isn’t too bad, it’s nicely burnt in parts on the outside and meatily juicy on the inside. Decent enough when you’re hungry and want more than ramen to fill the belly. Level 3 of the newly opened Parco Marina Bay has half a floor of Japanese restaurants, with two ramen shops, a tonkatsu place, Japanese Western (that’s Ma Maison), a regular diner and a sushi deli. DC and I chose the ramen shop with no queue: Keisuke Ramen. It’s quite an interesting proposition, having prawn-based broth instead of regular tonkotsu (pork bone) stuff. Everything on the menu was prawn-something, even down to the salad. Go only if you like prawn. The first thing DC noticed were the special chopsticks. 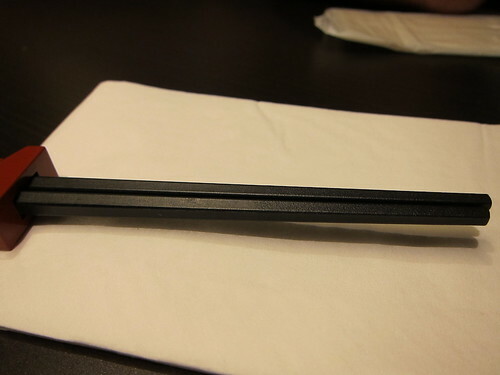 Notice how they’re pentagonal, presumably to help hold on to the noodles better. 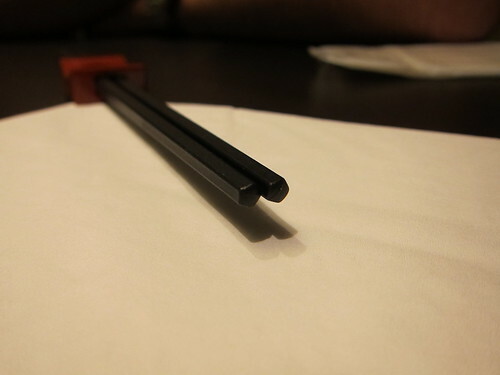 On further inspection of the chopsticks, we noticed that there was a special rough finish to the bottom part, again helping to grip the noodles better. This place certainly is very serious about its noodles! Another special touch was the distinctive shape of the bowls. The opening is slanted, making for an oddly private viewing of the diner’s progress of the meal. 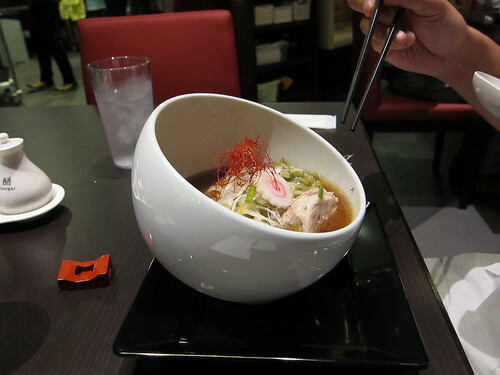 Ordering any “special” ramen would involve the extra toppings coming on a side plate. 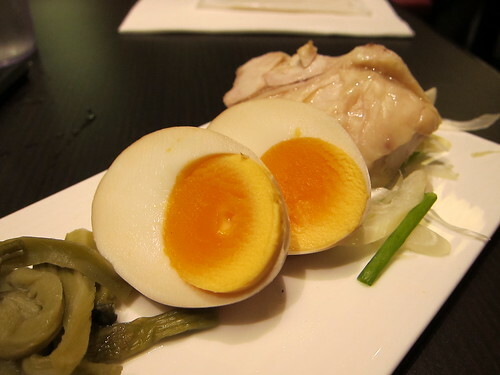 There was pleasantly briny pickled lettuce, rather disappointingly hard-boiled egg and chilled boiled chicken. They all went decently with the ramen but did nothing to steal the show. 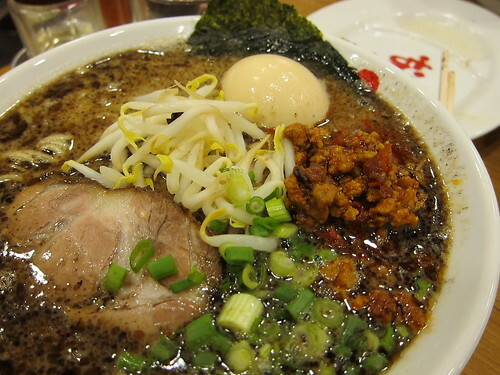 Now the ramen itself is quite different. Check out the dramatic presentation, complete with pretty deep-fried chilli shreds. Aside from the regular toppings, there was also prawn wanton in the special ramen and yuzu bits. 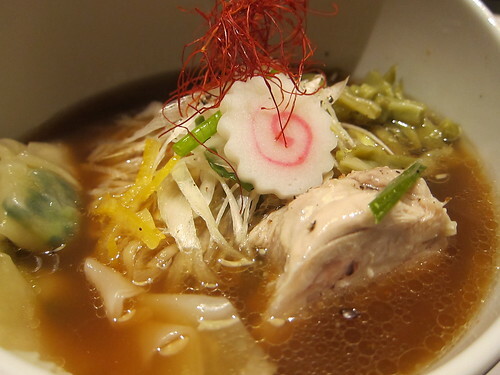 I quite liked this version, it was a vaguely Japanese yuzu-y twist on your typical hawker haemee broth. The noodles were very decent, not quite al dente but still chewy. I liked them. I felt that the miso prawn broth was something else altogether. 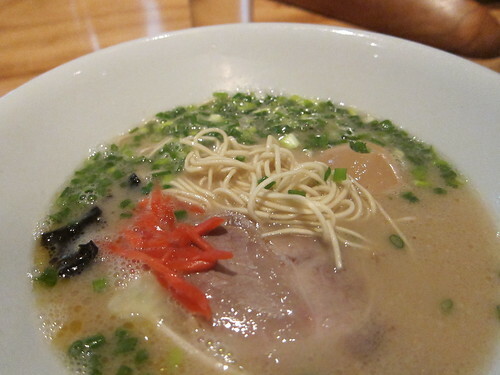 The creaminess of the miso gave the broth quite a different dimension. That, added to the special garlic oil, yuzu and earthy burdock bits, made it all quite complex and at times a bit confusing to the palate. On the other hand, it made for many changes in taste as I progressed to the bottom of the bowl. 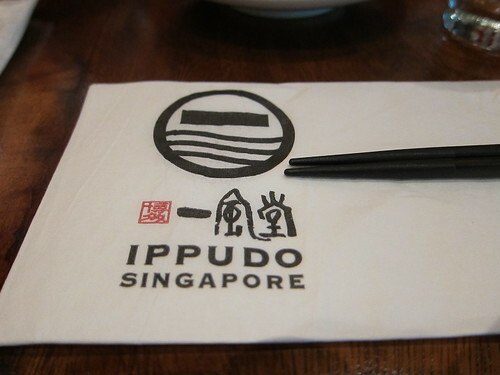 After two aborted visits to Ippudo, we finally made it there for a late dinner. Showing up after 9pm helped a lot. Learning from that trick, we returned a few weeks later and found that even on a Friday night, there’s not much of a wait post-9pm. We’d tried a few appetisers there and all of them were a unanimous FAIL except the Ippudo organic salad. 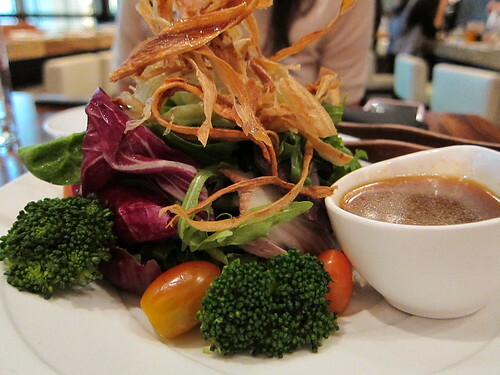 (We’d tried the prawn bun, beef tataki, and seasonal salad/vegetables. All were too flawed to make it to this blog.) 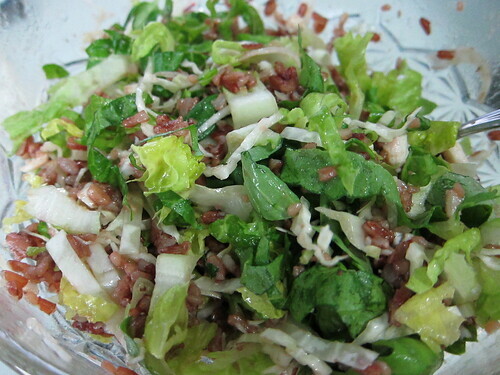 The salad was fresh and had crispy deep fried burdock chips as a topping. It was pretty decent with the shoyu-based dressing. I tried this year’s seasonal offering of Kyusyu Miso Tonkotsu with blended miso, cabbage, leek, pork belly, pork loin and half an egg. Even though I like my noodles on the al dente side and ordered them so, I found them a bit too hard for my liking. They got much nicer towards the end as the noodles soaked in the broth. 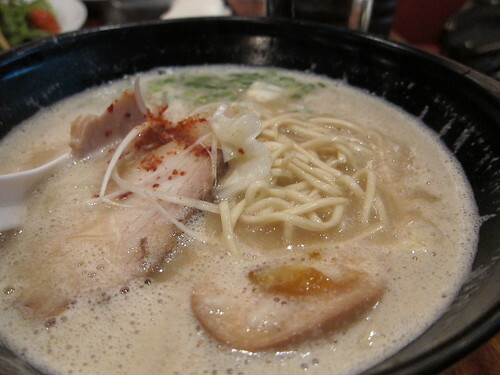 The broth was thick to the point of being almost creamy and had plenty of pork flavour without tasting too gamey. I wasn’t too sure about the persistent foam on top of the soup though! While I generally liked the toppings and found the chashu nice and tender, I felt that the egg was a bit of a let down because it was too solid. The yolk had just solidified and I thought it was too much to pay for what was essentially hardboiled egg. DC had the Akamaru Kasaneaji, the original recipe with blended miso paste, garlic oil and pork belly. It was rich but not too rich and had quite a comlex flavour with the oil, miso paste and pork stock all competing for attention. Too bad they were rather stingy on the pork though. On our second visit, I had to have the seasonal noodles again, and DC went for the Shiromaru with pork loin and cabbage. This time, the noodles weren’t quite al dente even though we ask for them hard. They were good when first served, but got soggy towards the end. I guess they need to work on being more consistent. My seasonal noodles were as good as ever and DC’s Shiromaru very decent. His pork loin wasn’t very tender but overall was well executed. My conclusion: Ippudo wins with excellent stock made from obviously superior ingredients and has good noodles, although the texture varies from visit to visit. Their toppings are decent but some are better than others, and they could definitely be a lot more generous with the pork slices. 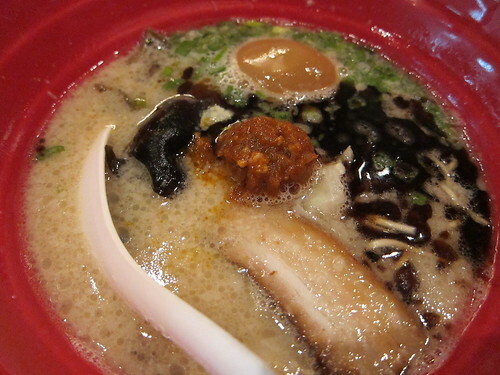 Where Ippudo doesn’t deliver is the egg, which really should be runnier. 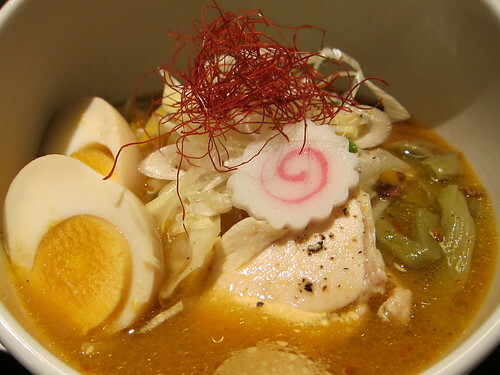 It’d win all round best ramen in Singapore if it fixed its egg. It’s definitely worth a visit, just not a long wait. 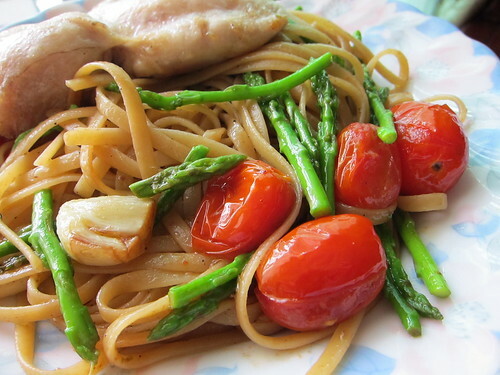 And focus on the noodles, don’t bother with the side dishes.